Competitions and good times at PBEx. Last weekend over the 4th of July, I attended the Portland Blues Experience, a perennial favorite event. Unlike standard dance events, PBEx is an experience unto itself (thus making it aptly named — it is not an “exchange” per se). PBEx differentiates itself by taking focus away from the dancing and placing it on the music. The event is run in parallel with the Waterfront Blues Festival, the second largest Blues music festival in the country. PBEx only runs late nights and always features more live bands. It breaks the standard form of 3 nights of evening + late night dances. Without the focal point of evening dances, attendees are given free reign to make each day and evening what they will. It’s more about the musical, social, and cultural experience of Portland, shared with dancers. I love it. PBEx was a very special time for me this year. One of the reasons were the competitions on Sunday. Rachel Stirling and I decided to join forces for both competitions this year. We didn’t really prepare at all — as would be expected when living in different cities — but have always relished dancing with each other. We went in with the expectation that we’d have a load of fun goofing around. And we did exactly that. I think it’s always best to approach comps with the mission to have fun. It certainly worked out well this time: for the second year in a row, I took 1st place in both the Jazz and Blues dance competitions. 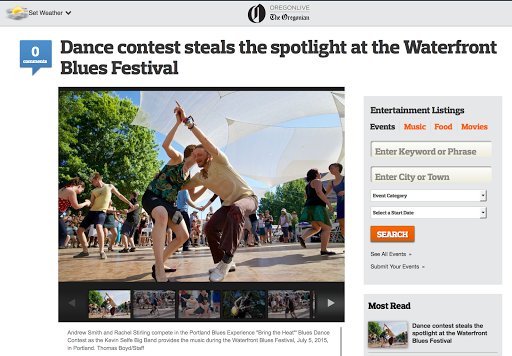 We were even featured in an article about the dance competition in The Oregonian. I am so happily surprised and grateful and overwhelmed by this result. I never dare allow myself to believe that I’m worthy of pulling off something like this. Yet here it is. (And for those who are long-time readers, you’re already familiar with my opinions about competitions and the kind of (limited) insight they can give you about dancing.) I recognize that competing is an extremely specific skill set, but it’s one I want to cultivate because it helps me get hired as a dance instructor. The results from PBEx are reassuring to me that I haven’t lost my edge despite my recent heavier focus on software engineering. It was a powerful moment of external validation: not necessary, but so freaking awesome to receive it. Also, it is just so much fun to bring that energy and magic to the dance floor to inspire other people. We both received praise from non-dancer spectators, saying how wonderful it was to watch us dance together and how in sync we looked. I also received a number of touching and humbling compliments from fellow dancers and judges, all of which make me feel deeply grateful. A few weeks ago while examining the next year of my life, I set an intention to affirm my presence as a dance teacher in the US. While extremely grateful for my success in Europe, it has come at the unfortunate cost of having lost a lot of awareness about me stateside. The phrase “out of sight, out of mind” definitely applies in the dance scene. Right now, I may be well loved and recognized by fellow instructors and friends, but I don’t have the kind of presence that gets organizers to reach out and hire me. With my new job allowing me to work remotely and providing an income stream to support participating in events without teaching, I see this next year as a great opportunity to train and compete. I’d say my mission is off to an excellent start. Next up: Nocturne Blues.